I know you're expecting a sarcastic comment about an election year in the US making it seem longer than normal, but no, 2016 is literally a longer year than most. (Although that bit about it seeming even longer has some merit.) What better way to start this bonus-sized year than with an issue of Linux Journal? I'm not a fan of resolutions, but I do have a challenge for you: learn something new this year. Personally, I plan to learn more about development. I dabbled in 2015, and it's given me the urge to learn more. Reuven M. Lerner is the perfect author to join on a journey like that, and this month, he teaches how to help improve client-side performance on your Web applications. Sure, we could buy everyone faster computers, but Reuven shows that there are better (and cheaper) ways to accomplish client-side improvements. Dave Taylor does some really cool calculations this issue and explains how to determine your age on other planets programmatically. There's more to it than that, but whether you plan to stay on Earth or migrate to Mars, learning to calculate with the date command will be a useful skill no matter where you live. Speaking of time, Kyle Rankin gives a lesson in how he spent many hours saving a few minutes. More specifically, he teaches how to use the Debian preseed procedure to automate disk encryption and partition creation. It sounds like something that wouldn't be too complicated to automate, but Kyle found it was a messy rabbit hole. His column should at least provide a flashlight if you decide to delve into a similar hole. I took a note from my own challenge this month and learned the exact way Linux systems deal with profile and RC files. It seems like a trivial thing to learn about, but it turns out that the procedures for loading profiles and such are fairly complicated. I was tired of just copy/pasting information into files without knowing exactly why some information goes into profiles and some into RC files, so I decided to get to the bottom of how those preference files are loaded. This month, I share the fruit of my labor and hope to demystify the shell-based config files for everyone reading. 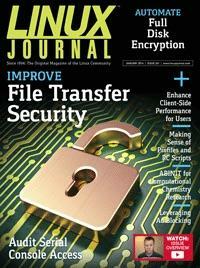 Encrypting filesystems and salting hashes are common ways to protect data on a server. Quite honestly, we're beginning to see the value in encrypting local data, and it's becoming common for servers to be secured more than ever before. Unfortunately, most security breaches aren't happening on the local machines; rather, they're happening over the network. It doesn't matter how secure your local filesystem might be, if you're not transmitting and receiving data in a secure way, no amount of local encryption will protect your data. Charles Fisher not only exposes the weaknesses with traditional file transfer methods, but he also explains how to shore up network transfers when sending and receiving data. Whether you consider your data sensitive or not, there's no reason to adopt insecure methods in your environment. Charles shows how to make sure you keep your private data private, even when you send it across the Internet. Fabien Wernli also discusses security this month, but rather than securing network transfers, he covers how to manage log files for console connections. Keeping track of serial connections to the server console can be challenging when your server number increases, but thanks to syslog-ng, you're able to log that information. Fabien then goes on to describe the process for consolidating log files into searchable archives and even shows how to integrate console logs into a real-time monitoring solution. If you manage a large number of servers via console or serial (even over the LAN), you'll want to read his article. Doc Searls finishes the issue by discussing the ramifications of ad blocking on the modern Internet. If you browse the Web, chances are pretty good that you use an ad blocker to make your experience more pleasant. Blocking ads means blocking revenue for content creators, and rather than pretending it's not an issue, we need to figure out how to respond in a way that is useful both to consumers and content creators. As usual, Doc has incredible insight, and you'll want to check it out. This first issue of Linux Journal in 2016 may be brand new, but it still has all the tech tips, product reviews and helpful information you've come to expect month after month. Whether the new year means ice and snow or sunshine and roses in your part of the world, we hope this issue helps start it off on a good note. We'll see you again next month, when February grows an extra day and is almost a full-size month!